The Promised Neverland Vol. 9 Review – AiPT! It’s humans versus demons at Goldy Pond. 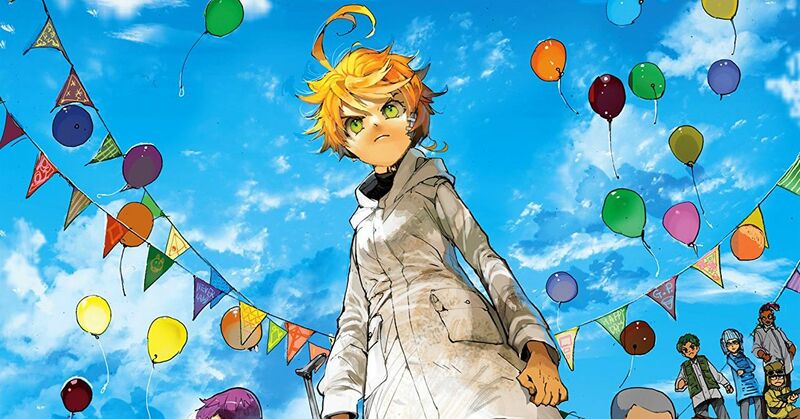 There’s a new volume of The Promised Neverland out this week, and boy is it jam-packed. We’re firmly entrenched in the Goldy Pond arc now with new lore, major revelations about main characters, and human-on-demon combat abound. Does this volume expand upon the series’ mythos effectively? How exciting is the action? Is The Promised Neverland Vol. 9 good? Lore-wise, this volume expands upon a lot of what’s only been hinted at previously. After eight volumes full of allusions to William Minerva and his mysterious but seemingly benevolent actions we finally get to actually see him, if only briefly. With that said, no sooner is his presence made known than more questions arise. The human world is subject to political upheaval just like the demon world is, and it becomes abundantly clear here than not all humans are sympathetic to the cattle children’s cause. Emma and Lucas also discover the actual gold pond that gives the arc and region its name, and there are some delightful fantasy touches in said scene. The series’ intrigue elements continue to impress as Emma analyzes Minerva’s clues and deduce answers to the series’ ever increasing mysteries. While these segments are all enjoyable, the truly stunning plot revelations take place roughly halfway in. An important player makes their first appearance after being absent for dozens of chapters, and though their page-time here is brief it shakes things up considerably. Their return also ties in information about another farm that reveals a whole different side of what the demons have been up to. This chapter is intense, increasing the sense of danger and taking a series that already has dark elements into downright macabre territory. This successful shift in tone owes a lot to artist Posuka Demizu’s work, which plays with body proportions in truly horrifying ways when depicting monstrous or inhuman-looking characters. The textures and shading throughout are also excellent. The contrasts between lights and shadows are especially well done, steeping the manga in a sense of mystery while illuminating just the right moments to push the horror through the roof. This volume’s action scenes are also excellent. The uprising against the demons of Goldy Pond has started, and it’s perhaps the most fast-paced physical conflict in the series to date. Demizu and writer Kaiu Shirai have done a good job with their brief introductions for the Goldy Pond kids, making their motivations and actions read believably. The villains for this arc are also fantastic. They reflect a level of demon society we’ve never really seen before, and their designs are some of my favorites in all of comics. As far as the art in these scenes goes, Demizu knocks it out of the park. The villains’ sadistic grins and sheer physical strength are especially imposing; the threats to the protagonists’ lives feel very real. Demizu also uses a great variety of page compositions that ebb and flow to match characters’ movements. These layouts lead the reader’s eye across the page effectively as the angles of lines naturally draw one’s attention from one image to the next. This even occurs with some well-placed and lively sound effects which look great. There are very few cons to this volume. Story-wise, the details about Minerva’s hidden messages could have been more effectively handled. There’s definitely a sense of fun to them, but they don’t feel properly set up. Emma references the contents of books her and her siblings used to read at Grace Field House, but the details of these stories never come up until it’s time to weave a mystery out of them. As a result these moments feel more tacked on than foreshadowed. There are also some times where the visual flow of pages is less effective than usual, and the layouts lead the reader’s eye in directions besides those intended. This is a very rare occurrence though. Overall, The Promised Neverland Vol. 9 is an excellent read that succeeds at almost everything it strives to do. The art throughout is excellent, delivering well-paced action and a powerful sense of the macabre. There’s also a good amount of lore expansion here. With that said, there are some occasional problems with flow and mysteries’ conclusions not feeling earned. Nonetheless, this is still a must-read. The Promised Neverland Vol. 9 is an excellent read that succeeds at almost everything it strives to do. The art throughout is excellent, delivering well-paced action and a powerful sense of the macabre. There's also a good amount of lore expansion here.